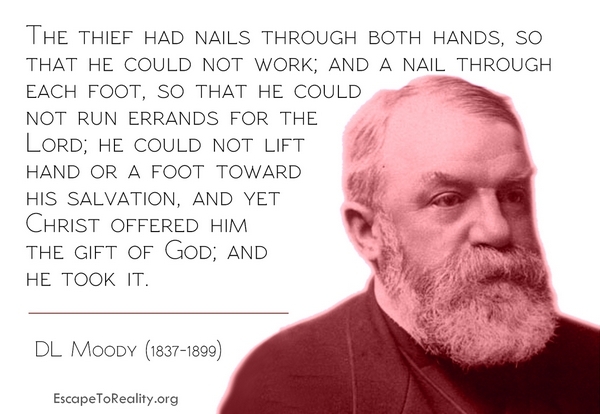 The thief had nails through both hands, so that he could not work; and a nail through each foot, so that he could not run errands for the Lord; he could not lift a hand or a foot toward his salvation, and yet Christ offered him the gift of God; and he took it. Christ threw him a passport, and took him into Paradise. Day by Day with D. L Moody, Moody Press, 1977, 90. Look at that Roman soldier as he pushed his spear into the very heart of the God-man. What a hellish deed! But what was the next thing that took place? Blood covered the spear! Oh! thank God, the blood covers sin. There was the blood covering that spear-the very point of it. The very crowning act of sin brought out the crowning act of love; the crowning act of wickedness was the crowning act of grace. Grace means undeserved kindness. It is the gift of God to man the moment he sees he is unworthy of God’s favor. A man can no more take in a supply of grace for the future than he can eat enough today to last him for the next 6 months, nor can he inhale sufficient air into his lungs with one breath to sustain life for a week to come. We are permitted to draw upon God’s store of grace from day to day as we need it. I am only one, but I am one. I cannot do everything, but I can do something. And that which I can do, by the grace of God, I will do.